(CNN) -- Spaniard Dani Pedrosa left it late to grab pole position for Sunday's French MotoGP at Le Mans. 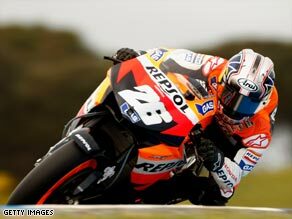 Dani Pedrosa looks the man to beat this weekend after the Spaniard took pole for the French MotoGP. The Repsol Honda rider claimed first on the grid with a best lap of one minute 33.974 seconds to edge out compatriot and rival Jorge Lorenzo. The Fiat Yamaha rider had looked set to take pole until Pedrosa pipped him right at the end of the qualifying session. Lorenzo was second quickest ahead of the Ducati Marlboro machine of Casey Stoner, with Lorenzo's team-mate and championship points leader Valentino Rossi in fourth. Morning rain had given way to sunshine in time for the qualifying session and Pedrosa left the best until last to claim his first pole of the season. Behind Pedrosa, Lorenzo, Stoner and Rossi was the second Repsol Honda of Andrea Dovizioso and the Monster Tech 3 Yamaha of Colin Edwards who had led the lap times earlier in the session. Next on the grid are Rizla Suzuki team-mates Chris Vermeulen and Loris Capirossi on a circuit where Vermeulen took the race win two years ago. Hayate Racing's Marco Melandri and the LCR Honda of Randy de Puniet complete the top 10 on the grid for Sunday's race. Experienced rider Sete Gibernau will miss the race after fracturing his collarbone when he fell from his Grupo Francisco Hernando Ducati during morning free training. Gibernau fell heavily on his left shoulder and suffered a broken collarbone for the third time in his career. The Spaniard was flown back to Barcelona to undergo surgery.